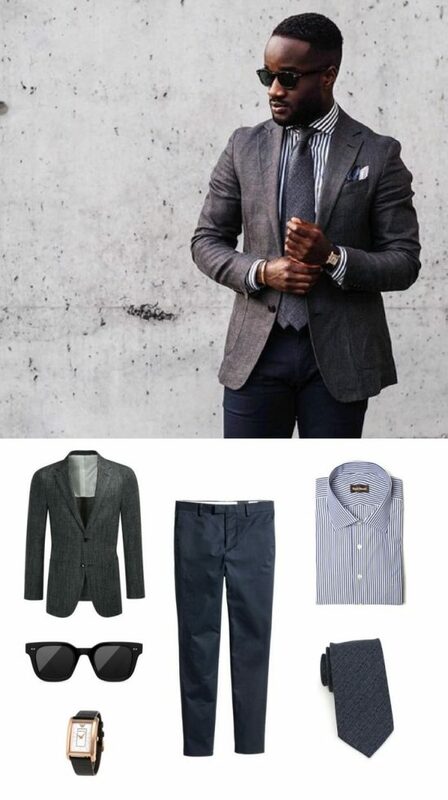 The perfect menswear combo of blue and gray creates a look perfect for the whole year. We love this look because it blends textures and patterns into an iconic look that works inside and outside the office. The textured charcoal gray blazer with the classic striped men’s dress shirt is a versatile combo that will go with many other pairings. This outfit is unique because it keeps in line with the dark tones in adding the navy chino and necktie. For a complete menswear look add in a watch, for a trendy touch make sure you include sunglasses.